The Daphne Cole Trophy was presented by the Inner Wheel Club of Clacton on Sea in memory of Daphne. 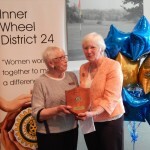 Daphne had served her club as Secretary and President before becoming the Founder Secretary of Inner Wheel District 24 and later District Chairman. Each year Inner Wheel members compete to win the Trophy. 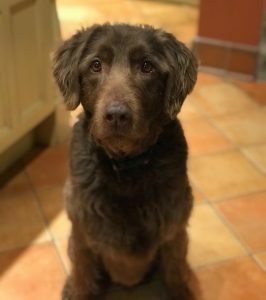 Members were asked to send in a photo of a dog and all club entries would then be made into a calendar to be sold for District Chairman Gill’s charity – Hearing Dogs for Deaf People. The winning entry, which was judged by Hearing Dog owner, Sophie Biebuyck, was sent in by Paula Matthews of Clacton on Sea Club and the trophy was presented at the March District Meeting to Eva Lewellen, Clacton Club President, on behalf of Paula who was unable to attend. Well done to Paula and many thanks to all members who submitted entries. The calendars were a great success, making a profit of nearly £550 for the charity. 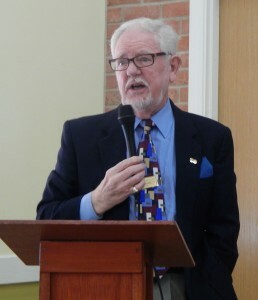 This year the Daphne Cole Trophy ties in with one of the objectives of the District 24 Membership Committee. On Inner Wheel Day, 10th January 2018, and Valentine's Day, 14th February 2018, the membership committee have asked clubs to leave small gifts in and around the community. The gifts will be in the shape of a small heart and will bear a label designed by the membership group with a short note saying "Inner Wheel at the Heart of the Community. The winning Club this year is Harlow, runner-up, Wickford. 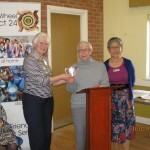 The trophy was presented Yvonne Bell, President of Harlow Inner Wheel, at the March District meeting. 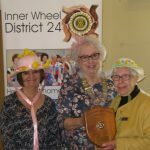 The photographs show District Chairman Celia and competition judge, Lesley, with representatives of Harlow and Wickford Inner Wheel Clubs and Celia presenting trophy to Yvonne Bell. 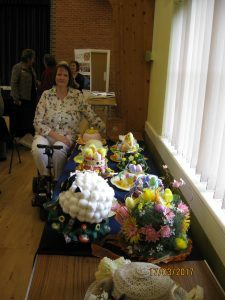 This year District Chairman Janet has set an Easter Bonnet Competition which was judged at the District Meeting on 17th March 2017. District Chairman Janet's daughter Joanne was the judge of the Easter Bonnet Competition she considered the rules and tried on the hats. The selected hats were of a weight that would suit a child and would secure well. The pink hat was Highly Commended but the winning club this year was Clacton on Sea. District Chairman Jane set a Creative Writing challenge for 2015-2016. The Challenge, to write 500 words (including any title), beginning " Seagulls circled silhouetted against the dawning sun, a new day was beginning"..... The word "Dementia" must be included. 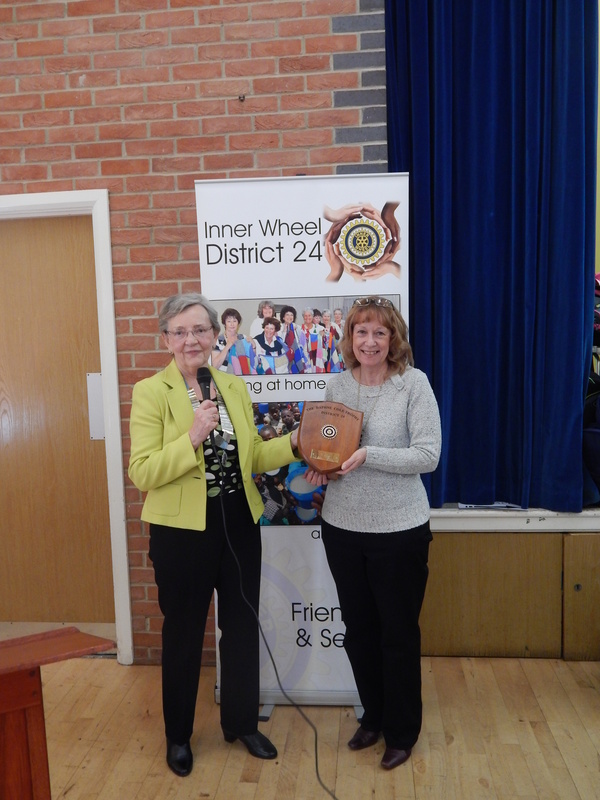 Paula Matthews from Clacton on Sea Inner Wheel was the winner for 2015-2016. She read her story and was presented with a replica trophy. The Colchester Club was runner up. It is hoped that the stories will be compiled in a booklet for circulation. District Chairman Jane was able to present Paula with the Daphne Cole Trophy at the District Dementia Tea, Paula read her story again. 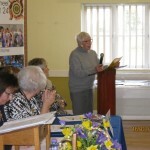 Carol Ninnim from the Inner Wheel Club of Colchester was runner up, she also read her story at the Tea. The stories, compiled in a booklet were available at the event. The competition held in March 2015 was a photographic competition and 27 entries were received. 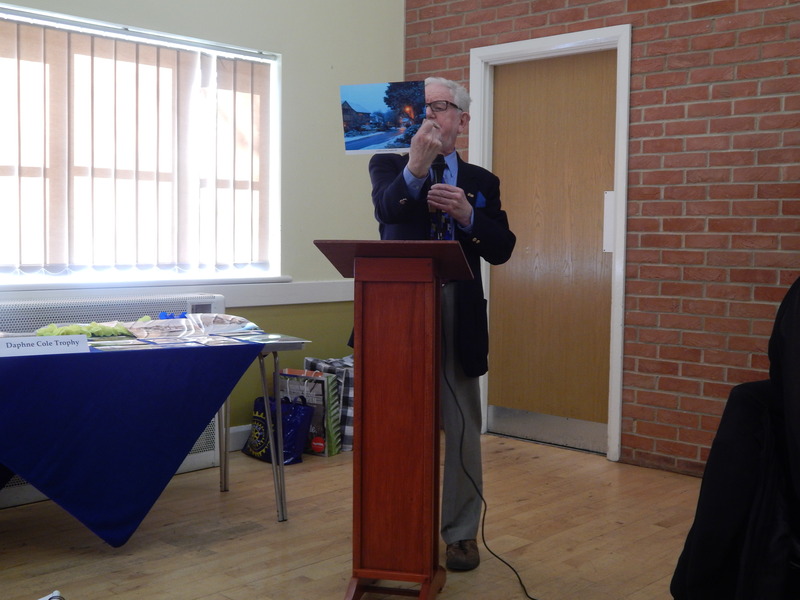 Rotarian Gilbert Cox judged the competition, he was pleased with the entries and noted some lovely shots, unusual photographs such as the foxes playing and sunsets were a hit. 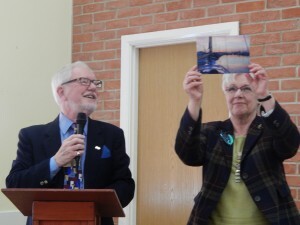 Gil, ably assisted by Anthea, announced the winner. 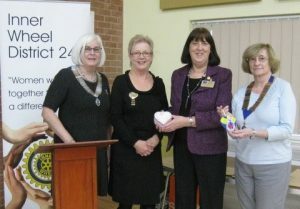 The entry was from Frances Jobson, President of the Inner Wheel Club of Rayleigh Mill. 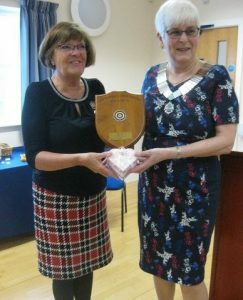 As Frances was unable to attend the meeting Jean presented the Trophy to Norma Bowers, Immediate Past President of Rayleigh Mill to take to Frances. 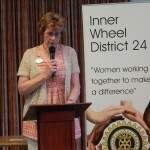 The runner up was Sue Lovey, Inner Wheel Club of Basildon.